Vo’s artistic style consists mainly of acquired objects, documents, and photographs that have personal significance or historical meaning. For example, the typewriter that Ted Kaczynski used to write his manifesto is on display along with letters written by Henry Kissinger. Three chandeliers that were present during the peace accords ending the Vietnam war hang from the ceiling, almost touching the museum floor. 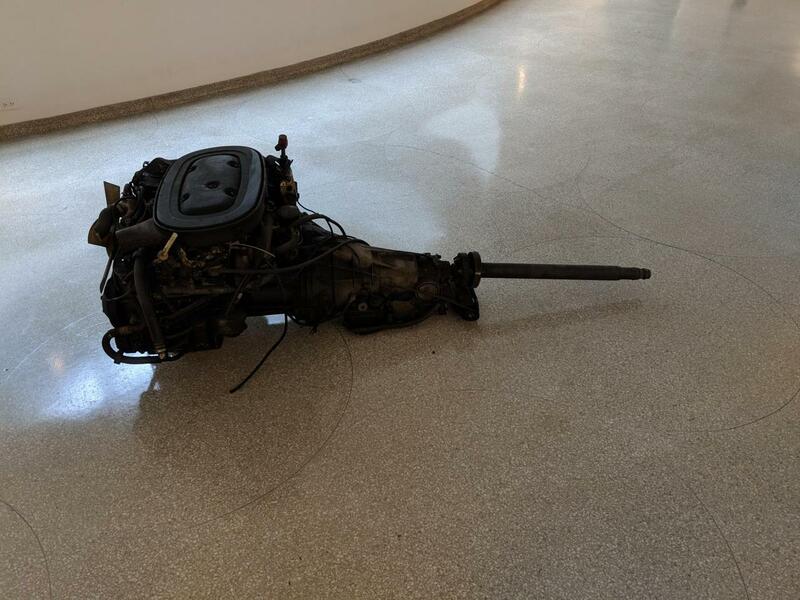 The car engine of his father’s Mercedes-Benz is placed in the middle of the Guggenheim’s ramped corridor. While viewing the collection at the Guggenheim, I found myself wondering what Vo actually did. What role did he play in the existence of these objects? Did he design or build the chandelier, the typewriter, or the car engine? No. So what did this guy actually do? Acquire objects that other people made, put them in a show, and then call it art? Why should I care about him? After a few revolutions around the Guggenheim, I saw him as more than just a collector of random stuff. He collects things with deep personal or historical significance that might otherwise be overlooked or discarded. The objects are objects with layers of meaning beyond the physicality of the things in front of me. Vo scours auction houses looking for artifacts that have layers of meaning, and it is that deeper meaning that he wants us to experience and relate to. The Unibomber’s manifesto fascinated and terrified our nation for years, and the typewriter it was typed on is the conduit through which that document entered the world and our nation’s consciousness. The letters from Kissinger are written by a man who played a significant role in how our country conducted itself during the Vietnam war, deeply impacting Vo’s family. The 13-star American flag, seen repeatedly throughout the show, was selected by Vo to remind us of the “anti-imperialistic ” origin of our country, unlike the meaning associated with our current 50-star flag, flown on military bases throughout the world. Danh Vo is a conceptual artist who acquires historical artifacts with layers of meaning that go beyond the physical objects themselves. His work explores cultural and personal themes related to national imperialism and its impact on his family, and is done in a way that is subtle and thought provoking. Wikipedia contributors. "Danh Vo." Wikipedia, The Free Encyclopedia. Wikipedia, The Free Encyclopedia, 10 Feb. 2018. Web. 12 Feb. 2018. Guggenheim Museum. “Danh Vo: Take My Breath Away.” Guggenheim Museum. Web. 12 Feb. 2018. Sayej, Nadja. “'Traumatized people don't talk about their past': how Danh Vo used art to move on.” The Guardian. 12 Feb. 2018. Web. 12 Feb. 2018.